Have Access Improvements to the Federal Crop Insurance Program Gone Far Enough? If you’re an onion farmer in Louisiana or a blueberry farmer in Iowa, the answer is most likely – no. The Federal Crop Insurance Program has gone through a host of changes since 2000 (the last time Congress passed a major stand-alone overhaul of the program), including several as part of the 2014 Farm Bill, but those efforts have so far not been dramatic enough to lure significant numbers of small-medium, diversified farms into the program. The biggest challenge to attracting more specialty crop growers (i.e., fruits, vegetables, and nuts) is the fact that most single crop policies for fruits and vegetables are available only in states and counties where a critical mass of growers can be found. While this works well for strawberry growers in California’s Salinas Valley, or tart cherry producers in Michigan, it has historically discouraged many specialty crop growers from seeking coverage. 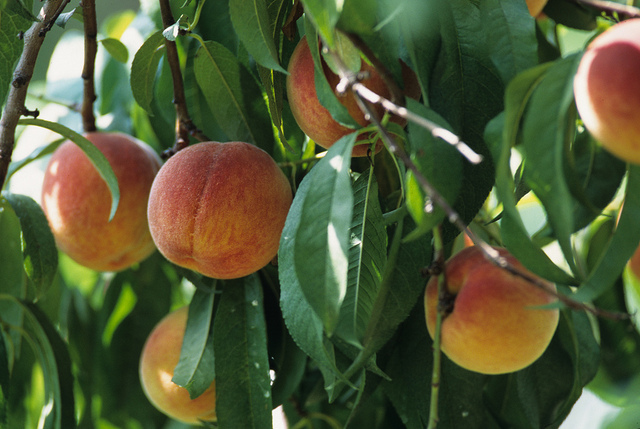 When interviewed by The New Food Economy for a recent article on crop insurance, Pam Clark – a peach grower from upstate New York – reported that her farm had gone without crop insurance coverage for its entire 200-year history. The combination of high premiums, complex regulations, and a program structure built more for large corn and soy operations than a small, family-run peach farm, were enough to convince this family (and many others) to forgo single-crop coverage. Unfortunately, that meant that this spring when a once-in-a-generation freeze hit the Northeast and devastated 90 percent of New England’s stone fruit crops, the Clark family was left unprotected. The Risk Management Agency (RMA) – the U.S. Department of Agriculture (USDA) agency in charge of managing federal crop and revenue insurance programs– recently issued a report highlighting several changes to the programs made in an effort to expand offerings and participation rates. Below we provide an analysis of a portion of the latest data, how far RMA and crop insurance programs have come, and how far we have yet to go to make these programs effective and efficient for all farmers. Federally subsidized crop insurance is currently utilized on roughly 233.6 million acres of cropland, about 83 percent of all cropland (excluding hay, livestock, nursery, pasture, and rangeland), with the large majority being in field crops. Although liabilities and covered field crop acreage have increased significantly since the passage of the Agriculture Risk Protection Act (ARPA) in 2000 (liabilities grew by nearly $70 million and covered field crop acres by 32 million acres), a closer look at the numbers reveals that this growth may not be all that it seems. While 32 million acres may seem like a lot of cropland, it actually only represents a 10-percentage point increase in the total number of field crop acres covered between 2000 and 2014. ARPA increased substantially the percentage of the farmer’s premium paid by the federal government as a way to bring more farms into crop insurance programs, but so far this seems to have spurred existing participants to increase coverage, rather than attracting significant numbers of new participants into the program – since 1999 the average coverage level elected by farmers has grown from about 66 percent to nearly 75 percent and the total liabilities for the program has grown more than threefold, to $102 billion in 2015. 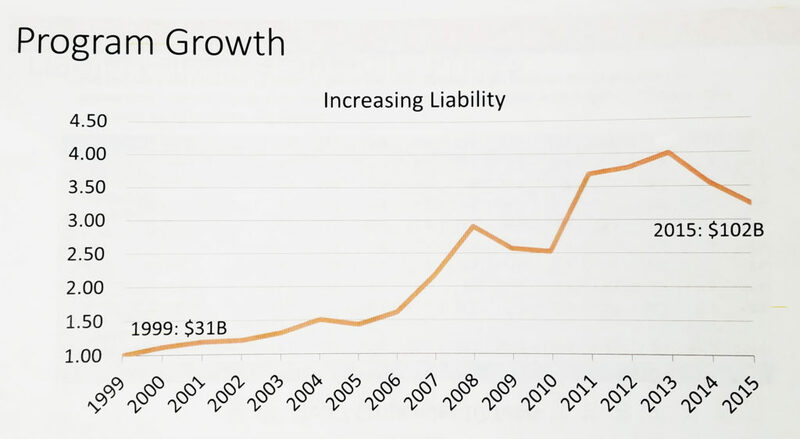 Increasing liability rates over time. Graphic credit: RMA. When a farmer signs up for a subsidized crop insurance policy, they must elect a coverage level between 50 and 85 percent of yield or revenue, depending on the policy. Premium subsidies are highest at the 50 percent (catastrophic coverage) and 75 percent levels, and decrease at the 80 and 85 percent levels. Most farmers choose the 75 percent coverage level. The data shows that the increased premium subsidies implemented by ARPA have functioned more to increase insurance levels for existing participants rather than to bring in new policyholders. The percent of fruit and nut growing acres covered by single crop insurance policies has held steady at around 74 percent since 2000, with more than one quarter of covered fruit and nut acreage (4.29 million acres) planted with just two crops, apples and almonds. Vegetable farmers have been harder to attract, with participation rising from 29 percent to only 36 percent of vegetable acres since 2000, with the current total federally-insured acres declining over the same period to now less than a million acres. Even with generous premium subsidies being offered, the lack of policy availability, and historic perceptions related to the structure and accessibility of crop insurance products will make enrolling more of these growers a bit of an uphill battle. A noteworthy bright spot in the RMA data is the growing number of insurance options tailored for organic producers. NSAC has been a vocal champions of this expansion and applaud RMA for their work in this area. To date, there are now price elections available for 57 organic crops, more than twice the number available last year. The Contract Price Addendum, which allows organic farmers to insure their crops at the contract price (which is higher than the rate for conventional crops), is also now available for 73 crops. Since 2008, organic production increased by 10 percent between 2008 and 2014, but the percentage of insured organic acres has seen more rapid growth – approximately 110 percent from 2008-2014. This is a positive sign that RMA’s changes have been successful in bringing more organic producers into the federal crop insurance program. However, given that 75 percent of all organic acres were without federal crop insurance as of 2014, there is clearly more work to be done. Low rates of participation in federally subsidized crop insurance programs by specialty crop and organic producers can be attributed to several factors: many farmers don’t grow enough of any one crop to justify the paperwork and time of taking out a policy, some prefer to rely solely on diversification as their risk management tool, and others avoid coverage because the payment rates do not cover the true value of their crops. Important improvements are being made to single-crop insurance programs, but for many farmers, there is an alternative option already available that can better meet their needs: Whole Farm Revenue Protection (WFRP). WFPR, unlike traditional yield or revenue insurance, is not intended for a single specific crop, but for all the crops and animals grown or raised on a single farm. The policy, which is available in every state and every county (the only policy that can make that claim), is aimed in part at helping these farmers that do not have single crop policies or price elections available for one or more of the crops grown. It also allows farmers to cover the organic premium or other types of market premiums they receive for their crops and livestock. In 2015, the first year WFRP was available, over one thousand farmers across 33 states signed up farms, with a per farm average of 3.2 crops insured. Most of these participants operated small and mid-sized farms, with an average liability of about $1 million. Preliminary numbers for 2016 show similar promise; RMA expects to see a doubling in the number of policies, now across 42 states, from farmers with a similar amount of average liability and a substantial increase in average number of crops per farm to 3.72 average. The federal crop insurance program is an important risk management tool for farmers across the country, but access to the program remains a work in progress, with hurdles to overcome for livestock, vegetable, and a wide variety of more diverse farming systems as well as for beginning farmers and farmers selling into organic, local, and other premium markets. As Congress moves closer to the next farm bill, it will be important that they take a critical look at the latest data crop insurance data, and that they hear from a variety of farmers – insured and uninsured – to ensure that the program is serving all of American agriculture.